All the telly worth staying in for. Secret agent Ethan Hunt and his team are implicated in a bombing at the Kremlin, forcing the American president to declare them fugitives. The spies plan to clear their name by abducting the real terrorist, which leads them into a pursuit around the globe. However, Hunt cannot be sure his colleagues are trustworthy. 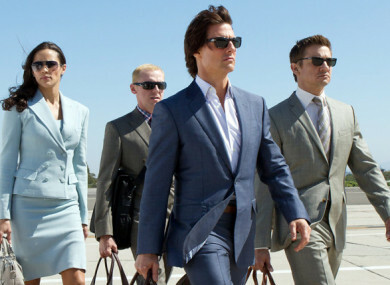 Action adventure sequel, starring Tom Cruise, Jeremy Renner, Simon Pegg and Paula Patton. Melvin Odoom hosts the final, and the four remaining teams must build a walking, talking robo-pet. The last two teams have seven days to create the biggest build of their lives, using as many as half a million bricks each. Their Master Build creations will be displayed at The Design Museum, before being assessed for the final time by Matthew Ashton and Fran Scott; and guest judge, Sue Perkins. Last in the series. Josh Widdicombe, Gemma Collins, Adrian Chiles, Melvin Odoom and Holly Walsh go for dinner together. They place their bank card in the centre of the table, play a series of fun and revealing games, and if they win, they can retrieve their card. The overall loser must pick up the bill for the group. They’ll be battling it out for the Glitterball trophy from 6 January for 12 weeks. Home Rescue (RTÉ On, 8.30pm) Like ‘Hoarders’, but for Irish people. Colombiana (E4, 10.00pm) After witnessing the murder of her parents at 10 years of age, Zoe Saldana grows up to be an assassin out for revenge. The World’s Most Expensive Toys (More4, 10.00pm) Check out the kids asking Santa for doll houses worth £22,000. Email “What to watch on TV tonight: Tuesday”. Feedback on “What to watch on TV tonight: Tuesday”.